The Fire and Water Podcast — Not just for fans of Firestorm and Aquaman, this is a podcast for anyone who enjoys comics and superheroes and nostalgia. The Relatively Geeky Network — Three podcasts for the price of one! Uncovering the Bronze Age, Quarter Bin Podcast, and Shortbox Showcase — all three are interesting and informative. Superman & Batman — Superman and Batman are awesome heroes and this awesome podcast is about both of them, usually looking at their appearances in World’s Finest. Parallel Lines: The DC Comics Tangent Universe Podcast — A podcast with a fairly focused, uh, focus. This one is going through the fifth week event DC published called Tangent, which completely and utterly reimagined DC Comics characters and concepts, retaining only the name. Earth Destruction Directive — Godzilla and many other Kaiju star in this podcast, which also has regular features about Godzilla comics and the classic Marvel series Shogun Warriors. 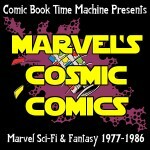 Marksmess Podcasts — Mark Adams has a few podcasts, and his comic book related podcasts are perfectly suited to comic book time travelers. He did a twelve part exploration of the Evolutionary War annual series and has just started a fifteen part series of the Atlantis Attacks Marvel annual event. Resurrections: An Adam Warlock Podcast — Al is a fan of Adam Warlock, and he is covering Adam Warlock from the beginning. He does it using guests and interesting conversations and discussions of the meanings and subtexts of the stories. Dave’s Daredevil Podcast — His name is Dave, and this is his podcast about Daredevil. You get it. You get it. This is an extremely well produced show that covers different Daredevil stories from the long history of Marvel Comics. He has a likable personality and his love and knowledge of Daredevil make the show one to listen to.